Egyptian Doctor – All Things AAFS! 15/11/2013 by All Things AAFS! Ancient Egyptian Physician’s Tomb Discovered. A tomb dating back to 4,400 years ago, which is believed to have belonged to an Ancient Egyptian doctor has been discovered in Abusir, south of Cairo. 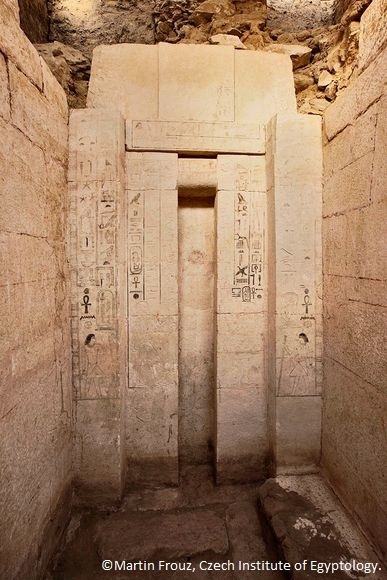 The false door to Shepseskaf-Ankh’s tomb, discovered in Abusir, south of Cairo. The tomb has been linked to a physician known as Shepseskaf-Ankh, whose name means “Shepseskaf is living”, due to the hieroglyphs which decorated the false door to the tomb. It is thought that Sheoseskaf-Ankh worked as the Head of Physicians of the Upper and Lower Egypt, whose duties included serving the royal household during the fifth dynasty, and has been linked to the king Niuserre, who reigned over Egypt for at least a decade. The limestone tomb was discovered by a team of Czech archaeologists, led by Miroslav Bárta, from the Czech Institute of Egyptology. Bárta, has expressed how pleased he is concerning the historical details that the tomb contains as well as the high level of architectural preservation. “Niuserre followed the policy of marrying some of his daughters to his top officials to keep their ambitions at bay. This is exactly the moment when the empire starts to break down due to rising expenses and increasing independence of powerful families,” explained Bárta. Abusir is part of the ‘great royal cemetery’ that’s found within a desert, west of the Nile, between Giza and Saqqara. The discovery of Shepseskaf-Ankh marks the third physician’s tomb to be found within this burial site. Other court officials as well as high-level priests were also buried in this site, keeping them close to their kings and rulers they served.